Starting on mobile before turning up on Wii U, the first Sky Force game was a decent shmup and now the sequel arrives on Switch. 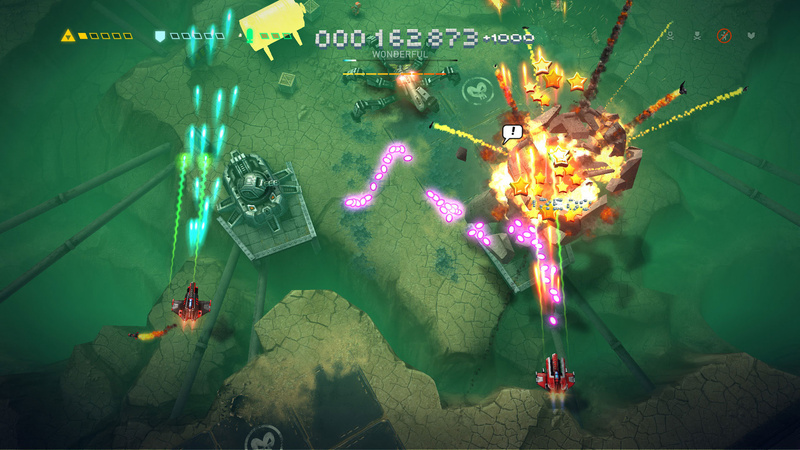 As you would expect, the aim of the game in Sky Force Reloaded is to blow away waves of enemy forces and take down the tricky boss characters. Soon after you boot it up the camera sweeps down and puts you straight into the action, letting you get familiar with the controls before the game begins in earnest. Once it does start however, you’ll find your craft is not quite as capable as the tutorial ship. 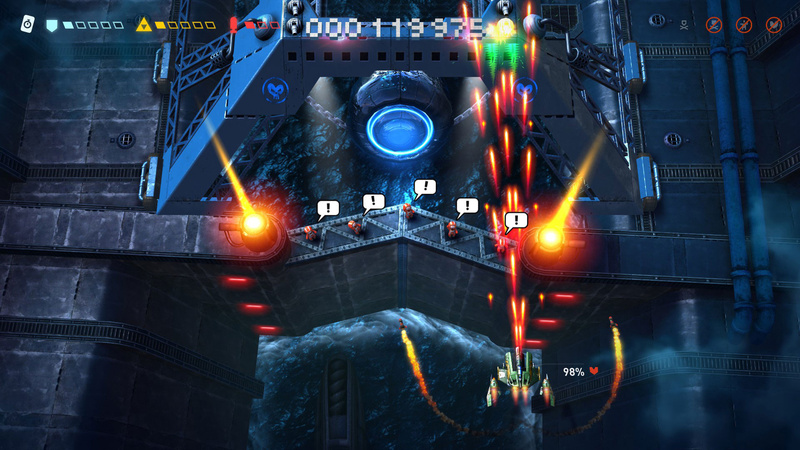 The first level is unlikely to cause issue, but by the second one you’ll find some regular ships are a struggle to shoot down and there are hard-to-avoid attacks. 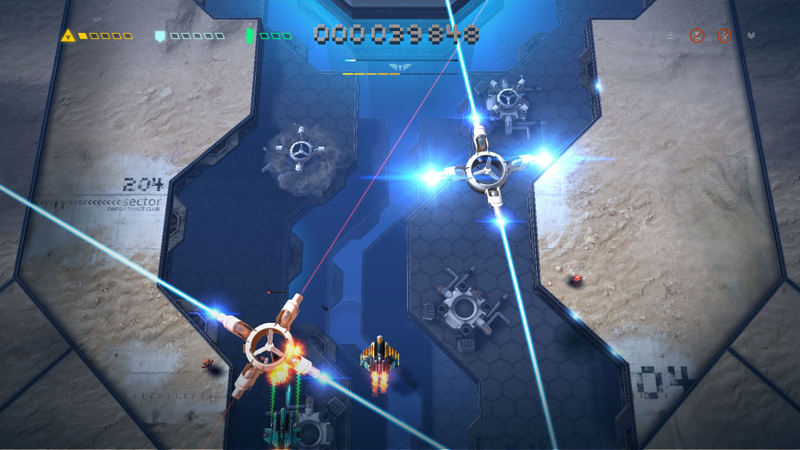 The difficulty increases as the game progresses with ships firing lasers and missiles your way, bullets spiralling out from turrets and cannons unleashing powerful energy blasts. Your ship is laughably underpowered for this battle, but then you are not meant to tackle the whole game the way you started it. With each enemy destroyed, stars are released and these should be collected as much as possible in order to beef up your ship. They can be exchanged for weapon upgrades (main cannon, wing cannons, missiles) and increased health. This makes things easier for you, but the challenge increases as the game progresses, so you may find yourself revisiting earlier, easier levels to collect more stars. There’s a magnet ability that can be added to help with this, drawing stars to you when you get close; you can also purchase upgrades to increase its range. The ability to use special items can also be added, allowing you to pick up temporary shields, a laser and bombs to be used when you wish (each is assigned its own button on the controller). These items can also be purchased prior to a stage in exchange for more stars, should you have any left. Cards occasionally pop up that, if collected, will provide (sometimes temporary) weapon upgrades and other useful functions. Machine parts can also be found and should you get a full set you’ll be rewarded with a new ship. There are nine in total, each with different abilities, such as the Iron Clad that is 10% slower than the standard ship, but can take 50% more damage, while others can be speedy but fragile constructions. Luckily the upgrades you purchase are applied to all of your ships, so you can switch to whichever you think is best-suited for the current level and not worry about losing any powerful weaponry. There’s a good variety of enemy aircraft in the game as well as some ground-based trouble, such as tanks. Rockets and pulsing energy blasts also add to your troubles and there’s quite a range of different attacks you need to learn to deal with. In some instances (certainly early on) it’s easier to avoid getting into a firefight and just edge your way through the hail of bullets, although if you’re not careful this can quickly go wrong and you’ll find yourself trapped. 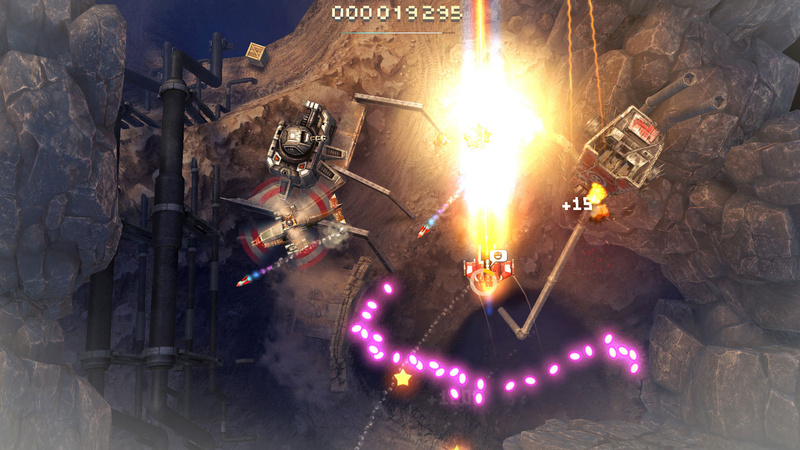 Weaving through fire is a skill you’ll definitely call upon for one level however, as it sees your weapons disabled, forcing you to slide through gaps in steady lines of energy projectiles, while also avoiding shots from moving turrets. Backing up the onscreen action is an adventurous synth music soundtrack that fits well with the sound effects. As well as popping bullets, there are zinging lasers, streaking missiles and rockets are fired with suitable oomph. Other neat touches include the sound of whirring helicopter blades and speech which announces each “weapon upgrade” and gives a running judgement on your chain of kills, ranging from “good” to “godlike” or “chain lost” when one gets away. The stages include a few locations, many of them rocky in nature. Some variety is provided by structures that are placed about the environment and there’s some different colouring used, too. The nighttime ones are bathed in a dark blue which makes the bright projectiles really pop from the screen. Other places you’ll be flying through include a desert and factory, but the most impressive stage is the one over an ocean, with boats bobbing about in the choppy waters. Some levels have clouds off to the side, obscuring the action if you head in there but on occasion being your best chance for survival. During one boss fight, your position is often identified only by the stream of bullets heading out from the clouds. Boss battles feature on eight of the thirteen stages and are enjoyable encounters that see you avoiding their different attacks while working out which piece of their weaponry you should disable first. Parts blow off as you blast away, with explosions rocking the metal menaces convincingly. These fights (and levels in general) can be tough at first, but once you learn where attacks are going to come from and have sufficiently upgraded your craft, you can clear the stage and move on to the next one. Maybe. While clearing a level is necessary to access the next one, there is also a requirement for a certain number of medals. Should your medal haul be lacking you’ll have to revisit previous stages to earn however many you need. Medals are awarded for destroying 70 and 100 percent of the enemies, clearing the level without taking a hit and rescuing the people stranded about the level; you simply hover over them to collect. These are the same on each apart from the weaponless stage, where the enemy destruction goals are replaced with star-collecting ones. Certain medals can be obtained with ease, such as the 70 percent one that you’ll usually get as a side-effect of clearing (or nearly clearing) a stage. In other instances it’ll take a few attempts to suss out the best way to achieve your goal and pick off that ship that keeps sneaking past or get out of the way of that rocket in time. Even when you have a plan, grinding for stars may be required to get your ship suitably equipped for the task at hand. You can of course go for the medals on your first attempt at a stage, but rather than face end after explosive end, it’s better to revisit after a few other stages have been cleared and your upgraded ship is better suited to the challenge. Replaying levels with the goal of achieving a medal makes for a different way of playing that, to begin with, helps alleviate the feeling of repetitiveness. Avoiding getting hit is not straightforward, but you can simply fly around some dangers. People-rescuing can be tricky with them perched close to all manner of dangers, but you can make it easier with liberal use of shields and bombs. Clearing the level is not required to get that particular medal so it doesn’t matter if the end-of-level boss makes short work of you. You don’t need all of the medals to get through the game and initially if you do need more to proceed, it won’t be many. As the game progresses, however, the entry toll increases and you’ll be revisiting past stages more and more, replaying the same stages over and over rather than just moving on to the next one - something which can get irritating. Get all four medals on a stage and you’ll unlock a hard version (filled with tougher to kill enemies that deal more damage) with four more medals for you to collect; grab those to unlock “Insane” difficulty. If you’ve mastered a certain level, these additional difficulty levels can be a good way to quickly boost your medal tally. Clearing the game is not easy, even with an upgraded ship. As you progress more and more dangers deal high-damage blows, quickly ending your attempt at glory. You do get to keep any stars you picked up though, so you can put them towards a new upgrade or purchase a useful special. You can also have a second player join you to help blast away the dangers. Once you do clear the game there is more for you to do, including two bonus levels – assuming you have enough medals, of course. Going back and collecting the medals you missed will keep you occupied (and there’s a fourth difficulty setting, too) or you could just replay your favourites, looking to improve your score. Scoring high is also the aim in the tournament, which is held each weekend. The game awards you some "Prestige Points" should you beat your friends one week, but does not appear to keep record of your best performance, so you'll have to screencap it, should you think you did rather well. Sky Force Reloaded is a fun shmup with a good variety of dangers to deal with and one that gives you a number of options to deal with them. Stages can be tough, but when you nearly make it you'll want to dive back in and try again, certain you know how to do better this time around. Sometimes you'll be forced to replay them in order to proceed further in the game, whether that's grinding for stars or looking to achieve a medal, although that can still feel fresh due to tackling the stages a different way. The thrill of finally beating a tricky level can be dampened by the realisation you need to go pick up a handful of medals however, but it can be fun to return to a previously tricky stage and ease through thanks to an improved craft. Sky Force Reloaded may force you to spend time with it and feel like a grind as a result, but for the most part, the time invested is enjoyable. 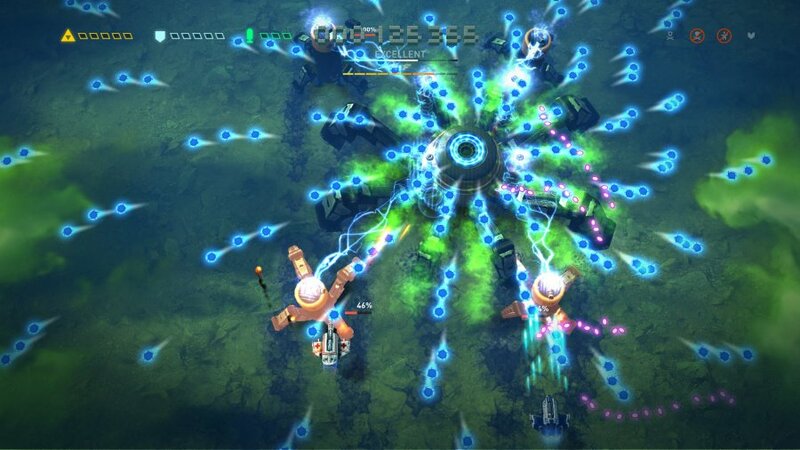 It's pretty, but I don't like the idea of grinding in a shmup... they are short and repetitive enough as it is. I like the genre, but "doing the same thing over and over" is already a staple in these games. It's a fun game, but no 8. 7 tops. Maybe a 6. As a shoot em up fan, the upgrade system just feels cheap. It's less about skill and memorizing the levels and more about grinding to upgrade your ship. I never like the feeling that I die because my ship is not powerful enough or that I win because I upgraded my ship. It should be about skill. Looking forward to grab this one today. I just can't get enough of shmups on the Switch and this European developed example does show it's producer's Commodore Amiga roots. 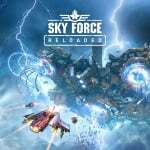 For me sky force is one of best shotter with modern graphics and fun to play.my opinion is 9/10 in shotter category. Definitely picking this up. Only problem is the name, if you had Skyforce Anniversary this sounds like just a updated release when it is a sequel. @BigKing I agree. I played this on mobile. It was great by mobile standards, but I had the same feeling as you described. The great gameplay is tainted by never feeling certain about whether your wins or losses are due to skill or upgrades. I prefer shooters to be more pure skill-based affairs without persistent upgrades. Has it on my Steam. Very fun game. Also the grinding is very fun. Been waiting for this for awhile already. Day 1 purchase. Anniversary was a good time on the cheap, and I'm glad to see this is as well. Will grab asap. @JayJ yeah I had to double-check the version of the game I got on Vita. I thought it was the same game but then I saw there were different unlockable ships and realized it was different. I enjoyed Anniversary and I'm pretty sure I'll enjoy this as well. I may have missed it (skimmed some of the verbose text) but does this game have multiplayer like the PS4 version of Anniversary does? I do not mind grinding. I will look into this one. Is this free like the mobile version....cuz thats the only way this would end up on my switch. Definitely not an 8, but fun for a little while. I had an itch for 1942 on the nes, and this filled that void on my phone. I may have to purchase one of those other schmups that look pretty fun. Does this game offer vertical screen in handheld mode? Wasn’t the biggest fan of Sky Force Anniversary so may get this on the cheap. Prefer the faster paced, over the top shm’ups from the Land of the Rising Sun; of which the Switch has no shortage of. Now its time for my customary: SEGA! WHERE’S MY HYPER DUEL!!!! The grinding thing and the way it works is an interesting mechanic that maybe isn't balanced quite right. I'd like to see it a little more forgiving and let you move ahead a little faster even if the overall game has a shorter play time. Or maybe I'm just not good at it. I've only played the mobile version of this, however, so I can't speak to whether it's balanced differently. 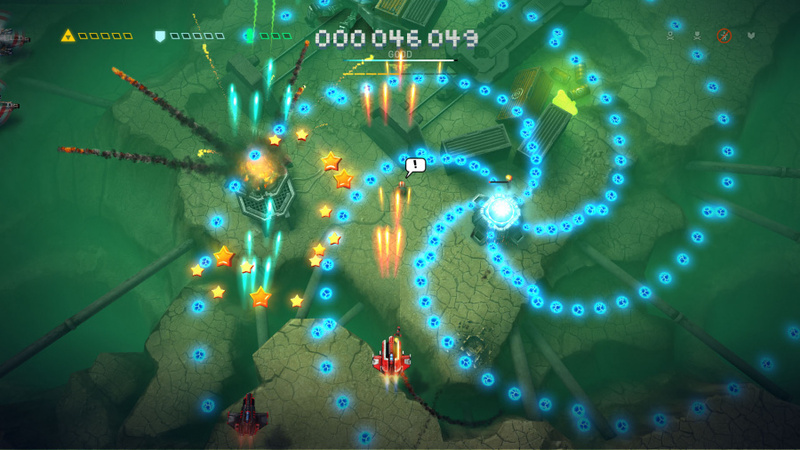 I really enjoyed Sky Force Anniversary's grindy take on shoot 'em up gameplay, so I'll definitely give the sequel a try. We have plenty of excellent classic shoot 'em ups on Switch, so it's nice to have some games that try interesting variations on the formula, too. All over this. Anniversary on Vita and PS4 gets smashed. Played Reloaded half to death on mobile. It is destined to be on my Switch. Does this have split joy con play? I was all about this one and then I heard about the grinding, kinda put me on the fence. I think i just associate grinding with JRPGS, I used to love them but ALL. THE. GRINDING. used to just eat my nerves, especially all the damn walking. I played one of the Sky Force games on mobile a couple years ago though, and it was really fun so I went ahead and picked this up today. Thing is, the grinding isn't just walking around trying to get into random exp. fights so I don't have an issue with it. Plus, my OCD loves things that task me with collecting stars, so it a win win. Digging it so far! @Mr_Pepperami wonder if NL are ready to do a shooter feature? Be good to see the whole lot ranked together. @Dualmask Yeah from what I have seen it does. I am surprised they didn't go with a different title, calling it "Reloaded" makes it sound like an updated re-release, but I guess like they are going for a Matrix sequel title kinda thing. Very awesome to have this for Switch now. I’ve been enjoying this on PS4. Also enjoyed the previous game, Sky Force Anniversary, on PS4/Vita. The two games are quite similar, with Reloaded having a few additional minor features, and a higher stage count. This game certainly requires grinding for upgrades in order to progress. It’s true that this diminishes the “pure skill” proposition of the game, which tends to be central for this genre. And yet, I still feel compelled to continue playing. I suppose I enjoy the intangible “feel” and aesthetics of the game, above all else. Having played 2D shmups for decades, it’s the kind of game I can easily step into & for short or longer periods - either zoning out a bit, or playing with more concentration. Wow I wasn't expecting this on Switch so soon, it was only released on non-mobile platforms a few months ago. Looking forward to it! Definitely one of the best modern shooters. You don't have to grind so much if you don't want to beat every difficulty level for each stage. But the grinding can be fun because you're always earning more cash to buy upgrades. I feel the game is quite balanced, and not excessively hard unless you choose the higher difficulties. So it's not like you need to be a shmup pro from the start. I'd agree with 8/10. I would've liked more variety with stage locations, and some more background music tracks (the tracks are good, there's just not quite enough). But overall it's a top quality modern shoot 'em up. I have this on Steam, but will be buying on Switch. Skyforce reloaded is an amazing shooter , love it on the switch, portrait mode would have been nice. I played for about 2 hours tonight. While it is weird being limited to a pea-shooter at first, the upgrades come steadily. They are PERMANENT upgrades, which is pretty unique; nothing worse in a shmup than losing your pimped-out weapons (except respawning without them!). Also, the hostage rescue is a nice feature; includes a rewarding “Yee-HAW!” when done successfully. @bluedogrulez Awesome, thanks! I make sure to check it out soon! I've already had another Shmup that turned into a disappointing grind. I like replaying stages, but I also like being able to move on when I want to if I've already completed a stage. Asking for more just for base progression is the textbook definition of padding. Got this last night, very satisfying progression system, especially unlocking higher difficulties for levels after beating them completely. Lots to do and unlock, it's a bit unfair to call it a grind because it's so fun and there is always something to do. Looking forward to playing more tonight, which is always a good thing. It gets my recommendation. @wizlon: You are dead on! I'm hooked to on the progression system. Can't wait to add (air quotes) The Laser Beam (end air quotes). Yee-Haw!! I agree Nintendo Life should write an article about the excellent shoot'em up situation on the Switch. With RXN -Raixin- (exclusive), Gunbird, Strikers 1945 I&II, Zero Gunner 2- (all basically current-gen exclusives where the old versions can be expensive), Dimension Drive (console exclusive?) and a good selection of multiplatform releases (Blazing Star, Aero Fighters 2, Sine Mora...) i'd say the Switch has already become the leading shmup console of this generation. Does anyone know.. where are the leaderboards?!? About the 8/10 score for this game, i think NL should have definitely given it a lower score. It's not bad, but for the people who don't buy every shmup that comes out, a 6 or 7 would have made it more obvious that it's not as good as the Switch's best shmups (Gunbird, RXN, Strikers 1945 I&II, Blazing Star, Aero Fighters 2, Zero Gunner 2). For people like me who want to play shmups 24/7, this is a nice addition to the collection, but people who only want one or two it should be clear that there are superior choices. Highly recommend this! It's quite different to other shmups, but all for the better imo. It's the perfect "one more go" game. Core gameplay is just right, and add the meta-game on top and you get a winner. Easy 8/10, maybe even 9/10 for the price you pay. no online leaderboards at the moment mean you can not 100% the game. Cool game to all the nah-sayers!! !